Left: San Francisco City Carriers Lau Ming, Daryl Ha and Alma Silva-Orden pose aboard the famous cable cars they use to travel to and from their delivery routes. Right: Death Valley Postmaster William VanBokkelen surveys the hot summer landscape outside his Post Office. This edition of Your Postal Podcast lets you walk -- or ride -- a mile in the shoes of USPS employees in two wildly different California communities, both of which attract the attention of tourists from around the world. First, you'll travel to San Francisco to learn how some letter carriers use the city's most famous means of public transit to service their routes. Next, you'll head south to Death Valley for some perspective on what it's like to provide mail service in the hottest town on the face of the earth. Read a transcript of the show here. Thanks for listening -- and don't forget to visit YourPostalBlog for dailyupdates on all things postal. Transcript for the August 2014 Podcast. 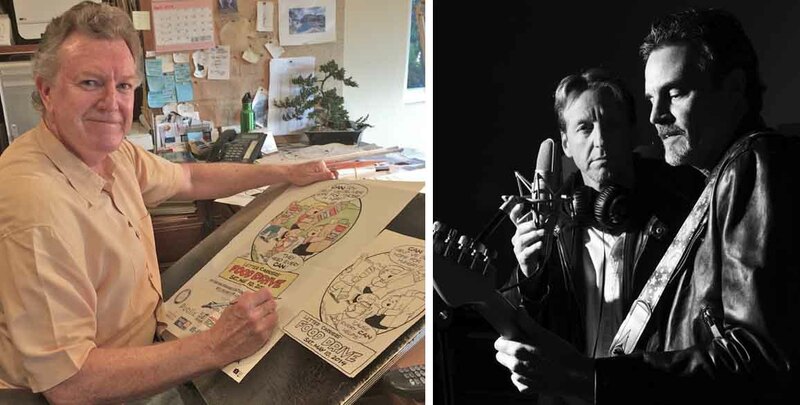 The story behind the Family Circus cartoons used to publicize each year's Stamp Out Hunger Food Drive leads off April's edition of Your Postal Podcast. Next, you'll hear how two Oregon letter carriers have formed a band to create music inspired by their work. The podcast concludes with a news roundup and details on how to enter to win an official program from the Austin, TX, First Day of Issue Ceremony for the Jimi Hendrix Forever Stamp. Listen to Your Postal Podcast on your mobile device at YourPostalPodcast.com/mobile. Transcript for the April 2014 podcast. 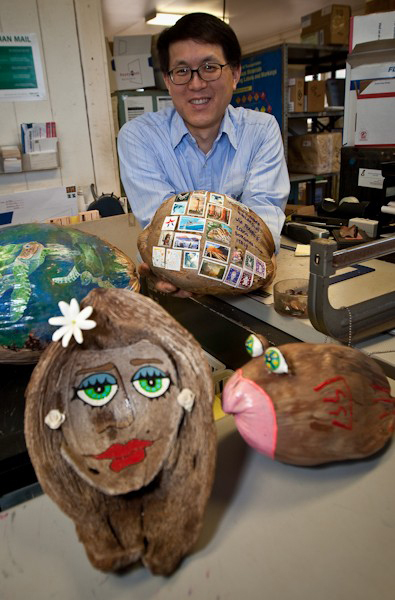 Photo: Hoolehua, HI, Postmaster Gary Lam helps customers send home hundreds of coconuts a month. The May edition of Your Postal Podcast opens with the tale of how one Post Office in Hawaii makes it easy for tourists to mail home one-of-a-kind nutty souvenirs. You'll also hear about this month's Stamp Out Hunger Food Drive. The show concludes with our regular look at the latest postal headlines. For a transcript of the program click here. Click on the "comments" link below and leave your suggestions and ideas for a chance to win a letter carrier bobblehead. Thanks for listening -- and don't forget to visit Your Postal Blog for daily updates on all things postal. Click here for a transcript of the May 2012 Your Postal Podcast. To submit a story idea click here. Making direct mail marketing simpler than ever for small business owners is the focus of this month's podcast. Listen to discover how new businesses are using the new "Every Door Direct Mail" program to target inexpensive mailings to specific delivery routes, without the need of a permit or address list. Photo top: Mark Weingartz, owner of Dan's Barber Shop and Mankato, MN, Letter Carrier Kim Roy take a peek at Belle Mar Center's Every Door Direct Mailing. Photo bottom: Employees at the Blue Valley Branch of thhe Shawnee Mission, KS, Post Office gather to help "Stamp Out Hunger." For a transcript of this podcast, please click here. Please click here to share your comments and ideas for future editions. Thanks for listening! In this edition, you'll hear from a group of employees in Minnesota who are hitting all the right notes, learn about employees in Phoenix who helped a co-worker in need, meet a Wisconsin postmaster who encourages "clothes" encounters of the second and third kind, and get the final tally on the NALC Food Drive. In this volume, you will hear about mail delivery to the Grand Canyon, the new Flat Sorter Sequencing System and a mailer who ships books to collegians. Also, you'll hear a Money Minute segment about the Thrift Savings Plan and you'll have an opportunity to win a free MP3 player in the Podcast Trivia. The podcast is just 10 minutes long. You can listen to it in this window, or your can use a sidebar subscription to add it to your iTunes or a RSS syndication to have future issues sync with your MP3 player. And we would love to hear any comments you have for this edition or suggestions for future podcasts.